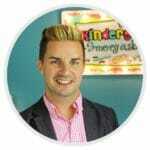 Hello friends, It’s me Katie and I am back guest blogging for Greg on the #happyclassroom movement. We are tackling the issues that pop up and might make us feel stressed out and consequently might make us grouchy. A grouchy teacher does not equal a #happyclassroom. Yesterday we tackled really messy printing. Today we are going to get the kids hungry to get those sight words done. Nothing is more heartbreaking, annoying, or frustrating than kids and families picking daisies on their way to the finish line. We are going to get them running to the finish line with a smile on their faces!!! Today’s shout out encourages those kids who are making baby steps and those who are finishing their grade level words. Sight words are a major focus in grades K-2 and with good reason! We knew this already, but sometimes the parents are unclear what all the fuss is about. so Here is a little parent note for you you to send home too. Grab your freebie by clicking the picture below. Part 1- Poor printing and lack of desire to print so others can read it.